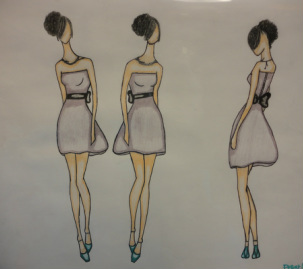 This is a fashion deisgn that i drew on my visioneer challenge in Art. I choose this design because i was trying out how i would want the summer clothes to look like, and designs that would be a little more interesting. Another Visioneer design #2. I choose this design then thinking about special occassion alot of people likes to wear dresses to many occassions that is why i choose to draw this design. Visioneer design #3. 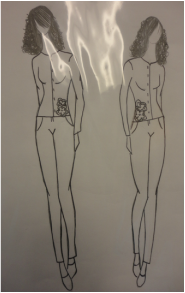 This design came up to me when looking through my clothes or dresses that i wasn't wearing anymore that is why i came up with the design, and the flowers were added because i wanted to have more designs on it. Visioneer design #4. This design is for business people, i came up with this thinking that i should try something new that would be interesting to other people who are at work also. 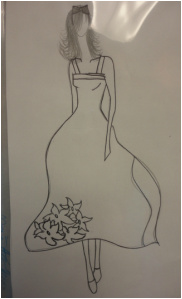 This design was drawn in Art class, because every friday we would have to turn in a sketch on the inspiration that we had. The inspiration on this design was pearls, i choose to have her wearing pearls around her neck. Also i knew that a dress would come really nice with the pearl necklace. 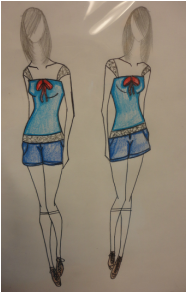 This design was base on News paper that was one of our inspiration, i was combining summer clothes along with other designs on it. Instead of making the clothes News paper i decided to make her socks News paper. The inspiration on this design is Leaf, at first i couldn't think of what to draw on this one it was the toughest one but i manage to came up with an idea. I just started drawing leaf on the shirt then i came up with this idea. At first i was thinking about making this a dress but i thought that it wouldn't be fit to be a dress so i decided to make her wear pants and a tanktop. This drawing wasn't really as good as i thought it would turn out, the inspiration on this one was Shells. I couldn't think of where to add the shell on so i decided to put it on her dress by the straps. 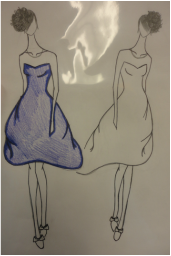 The inspiration on this one was Tulle, at the bottom of the dress i decided to add the tulle on. I wanted it to look as if it was a really pop out dress like for prom but i decided to make it shorter to show the tulle. This inspiration was on feathers, i wasn't sure how or where i should add the feathers on so i decided to make her skirt as the feather and add a flower onto her hair.